Having seen the film, I really wish the drama could have had a film budget, because the dynamic cinematography and lushness of the world are missing from the drama in a really palpable way. 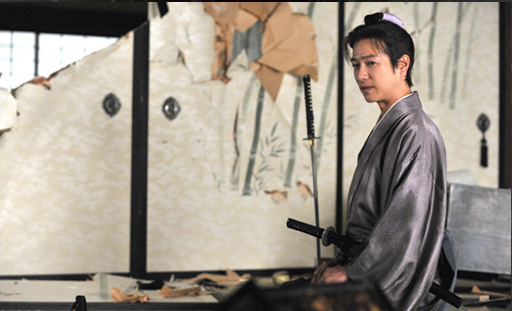 The episode opens with Sutezo (KUBOTA Masataka) dreaming about his past–considering whether to take his companion’s offer of marriage and an easy life or to beat her up and take her money. When he wakes up, Masakatsu (HIRAYAMA Hiroyuki) and Kasuga (ASÔ Yumi) explain to him his job in the ôoku: to produce an heir with the shogun Iemitsu (TABE Mikako), whom they view as a regent until a male heir is born. They are concerned with Sutezo’s lack of class, particularly compared to Arikoto (SAKAI Masato), and worry that Iemitsu won’t like him. Kasuga meets with him to lecture him about how to best approach Iemitsu (don’t talk), then, in a particularly cruel twist, assigns Arikoto to mentor him since Arikoto is the only concubine to whom Iemitsu is actually attracted. The next morning, Gyokuei comes in to find Arikoto seated in the middle of his room, which he has completely destroyed with his sword. Arikoto tells Gyokuei that he is a hypocrite and that Gyokuei was right about his not being okay with Iemitsu’s seeing other men. Later, Masakatsu gives Arikoto a kitten he found–a white one that looks just like Wakamurasaki/Oneko-sama from episode 3. Gyokuei sees the kitten and is shocked; later, he confesses to killing Wakamurasaki and framing Shigesato to get revenge on him. He breaks down, telling Arikoto that even though he has acted in revenge and against Shigesato and has thoughts of hurting Sutezo, that saintly Arikoto should be dragged down into the muck too is unbearable. Arikoto, of course, forgives him, telling Gyokuei that he is “a good child” (ええ子や). Soon after, Iemitsu is confirmed to be pregnant. Her face belays mixed feelings–fear of possibly losing another child; sadness that the father is not Arikoto, who has been banned from her quarters; and even a twinge of relief. Arikoto sends congratulations; Sutezo is beside himself with joy. That summer Iemitsu gives birth to a girl. I loved the scene in which Sutezo meets Iemitsu for the first time. Even though Tabe slight and Kubo stands a full head taller than her, her violent refusal of his offer to let him “take the lead” was very convincing, perhaps because one can see how easily he would have underestimated her strength and will. 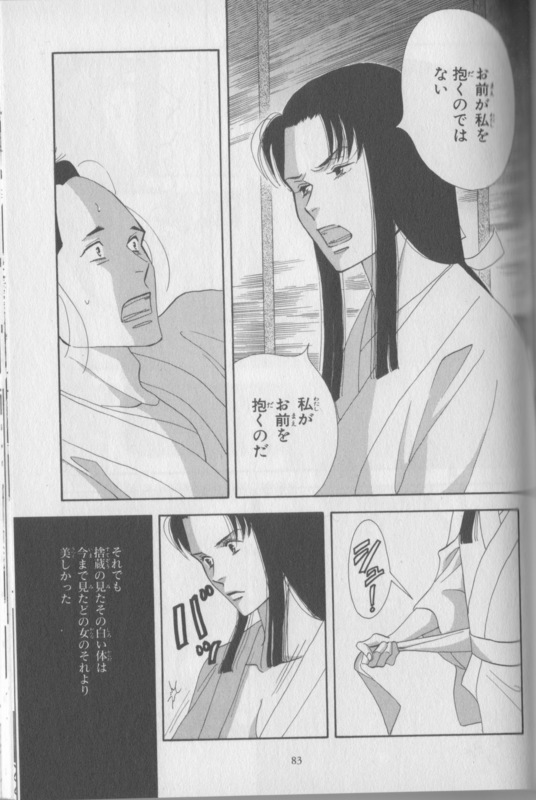 Interestingly, in the manga, Iemitsu then disrobes facing him; her face is hard to read (anger? determination? resignation?). In the drama, she turns away from Sutezo to disrobe; this may be to make it more dramatic or for fear of showing too much chest on TV. Tabe makes the same face as manga!Iemitsu, too, which was a nice touch. Also, the cut to Arikoto alone in his room was a great transition; this highlighted his inability to lie to himself about what was going to happen with Iemitsu and Sutezo as well as his loneliness and anger. On a humorous note, one of my friends watching this expressed displeasure at Sakai’s “smug-zen” face, which she pointed out didn’t happen at all in the manga. His acting is good, but I like him so much more as calculating Emonosuke in the Eien film! One of the shared themes of the Iemitsu and Tsunayoshi arcs is the parent-child relationship: in Iemitsu’s, Iemitsu II’s relationship with mother-figure Kasuga (as well as Masakatsu’s, Kasuga’s biological son, relationship with his mother) and Gyokuei/Keshoin’s relationship with his daughter Tsunayoshi. Although Iemitsu dies while Tsunayoshi is very young, both women have a parent or parent-figure who constantly stresses the importance of carrying on the family line and goes to extreme measures to ensure she do so. I find it interesting that Gyokuei’s later echoing of Kasuga really interesting–even though Tsunayoshi is his and Iemitsu’s daughter, Iemitsu’s unhappiness at her separation from Arikoto and death from complications of miscarriages does not deter him from urging Tsunayoshi to continue the line. On the other hand, perhaps because he has had the importance of carrying on the line (versus naming an heir from the Owari or Kii branches of the Tokugawa family) drilled into his head, knowing the Iemitsu basically died trying, and also knowing his daughter occupies the most important position in the country makes him press on, even when she is too old to bear another child. (Tsunayoshi states at one point that a former monk who has lived surrounded by men his whole life probably knows nothing of female biology.) Even though we see many of the main characters from their adolescence to their old age, the difference between young Gyokuei and old Gyokuei is so stark that it actually reminds me a little of the character development in Citizen Kane in so much as we see a “bright young thing” full of ambition turn into a lonely old man who pushes away or loses everyone he has cared about. Speaking of Gyokuei, one of the added scenes was the one of the Wakamurasaki/Oneko-sama doppelganger. Gyokuei sees the cat and freaks out, an episode that leads him to confess that he killed the cat and framed Shigesato. I found this neither added nor detracted from the plot, but it might have helped reminder the audience of that incident prior to his confession. Next time on Ôoku: problematic persimmon trees. *While this is actually a really progressive stance on having partners outside a primary relationship, Arikoto actually discovers he can’t handle it as well as he had hoped. I feel that this is not a condemnation of non-monogamy but evidence that individuals fall on a spectrum of how they personally feel about open relationships. It wasn’t right for Arikoto and Iemitsu because neither of them were willing (it is a duty) and because of their personal desires for exclusivity, but that doesn’t mean it can’t work for others in different situations–for example, in vol. 7, Yoshimune has a happily companionate relationship with her attendant (infertile) Sugishita, who also acts as a father to her daughters, but sleeps with all the eligible men of the ôoku in turn (as well as some of the low-ranking staff). You’re right… these next few episodes put our emotions through the ringer. I bawled like a baby. Thank you! I have to say, though, that Yoshinaga’s style of written and visual narration in the manga was very, very effective in this. The films did a really good job with the cinematography as metaphor (more on that in the post I’m writing about the film). I’m not in love with the shooting style of the drama (more camera angles, please?) but the interactions between the actors are consistently good.